Gift cards can be a great gift idea, especially for restaurants! Who doesn’t love to go out to eat? Here’s a few holiday restaurant gift card promotions that allow you to give a great gift while getting a little something back for you! Applebee’s: Buy $50 worth in Applebee’s Digital Gift Cards online and receive a free $10 Digital Bonus Card. The Aquitaine Group: Receive a complimentary $20 dining certificate for every $100 you spend on Aquitaine Group Gift Cards. The Aquitaine Group includes Aquitaine, Gaslight Brasserie, Metropolis Cafe, Union Bar and Grille, Cinquecento Trattoria, and Greenlight Cafe. Ben & Jerry’s: Grab a free Scoop of Ice Cream when you spend $10 or more on Gift Cards at your local Ben & Jerry’s Scoop Shop. Buffalo Wild Wings: Buy $25+ in Gift Cards and get a blazin’ bonus that could be worth $5-$100 at Buffalo Wild Wings! CBS Scene at Patriots Place: Buy $100 in gift cards and receive a free $20 gift card! Fleming’s Prime Steakhouse & Wine Bar: For every $100 in Gift Cards purchased, receive a free $20 bonus card. Longhorn Steakhouse: Buy a $25 Gift Card, and receive a $5 coupon off your next purchase when you buy 2 entrees. Margaritas Mexican Restaurant: Buy a $50 gift card, receive a $10 bonus card, and/or buy $100 worth in gift cards, receive a $25 bonus card! 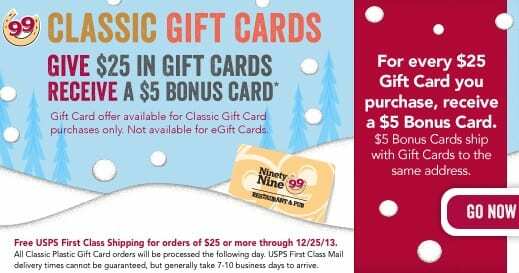 Ninety Nine: For every $25 Classic Gift Card purchased (not valid on eGift Cards), receive a free $5 bonus card! P.F.Changs: Receive a $20 bonus card when you buy $100 in P.F.Chang’s gift cards. Smokey Bones: Buy $25 in Gift Cards and receive $5 for yourself. Texas Roadhouse: Receive a free $5 eGift Card on a future visit when you buy $30 or more in gift cards online. T.G.I. Friday’s: Get a free $10 Bonus Bites Card for every $50 you spend on Gift Cards. Uno Chicago Grille: For every $25 spent in Gift Cards, receive $5 bonus card for a limited time. Yardhouse: For every $50, receive a $10 bonus card on future purchases. There are so many great holiday gift card deals happening. What gift card promotion is your favorite? Did I miss great holiday gift card deal?